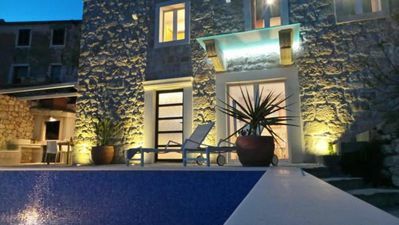 Beautifully and sympathetically restored 1st floor apartment in a traditional Dalmatian stone house set in a courtyard a minute from the main square in Kastel Stari where you can enjoy the fresh local produce at the daily farmers market. A perfect location close to bars, restaurants, supermarkets and only a couple of minutes to the local beach. Both Split and Trogir can easily be reached by the local number 37 regular bus service. Split airport can be reached by car in only 10 mins. The apartment consists of 2 bedrooms, bathroom and a kitchen/living room with air conditioning. A fully-functional kitchen comes with electric hob, oven, microwave, large fridge/freezer and washing machine. There is a toaster,plenty of cutlery, crockery and cooking utensils if you decide to have a night in from visiting the local restaurants. An iron and ironing board is also available to guests. The dining table seats 4 and has a beautiful view over the Kozjak mountains. The sofa can easily be converted into a double bed and the television shows local programmes as well as some English-speaking alternatives. Books and tourist information are available to guests. Large double bed, bedside cabinets, 4-drawer chest of drawers and wardrobe. There is a table and chairs in the courtyard which is for use by guests. . 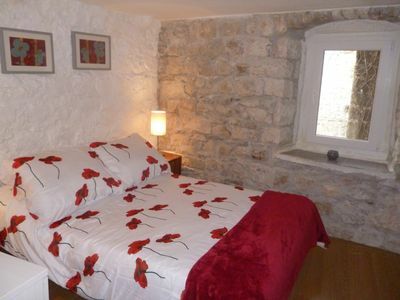 If you want to experience the real Croatia and stay in the heart of a traditional village close to all amenities then this is the place for you.